Posted c1974. Garden wall absent. Posted 1904. New thatch, chimneypots and downpipe, garden wall repaired. From an old pamphlet c.1920. Taken 2007 by Maureen Griffiths. New porch and garden wall rebuilt. 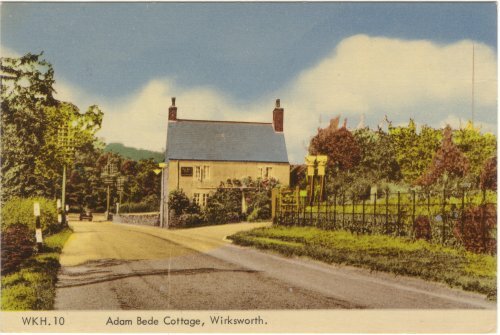 At the southern end of Wirksworth on the Derby Road stands Adam Bede Cottage (OS ref: SK285526) opposite to Haarlam Mill. 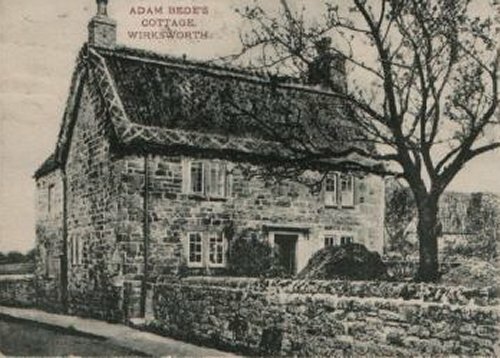 This is where Samuel EVANS and his wife Elizabeth came to live in about 1814 and were portrayed as Adam Bede and Dinah Morris in George Eliot's famous novel Adam Bede. George Eliot, whose real name was Mary Ann EVANS, was the niece of Samuel and Elizabeth EVANS and came to stay with her aunt and uncle in 1826. 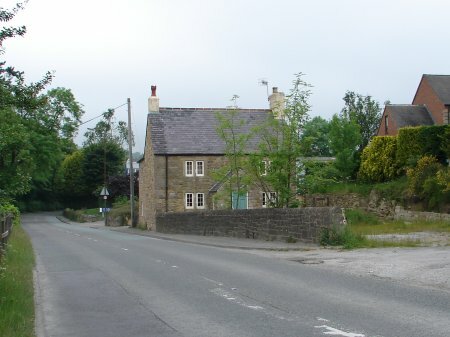 The visit made such an impression on her that in the novel she wrote about Wirksworth calling it Snowfield, which placed the town on the literary map. The origin of the novel was a story told to George Eliot by her aunt, who had visited a young girl in Nottingham Prison. This girl, Hetty SORREL, who had been condemned to death for the murder of her child. 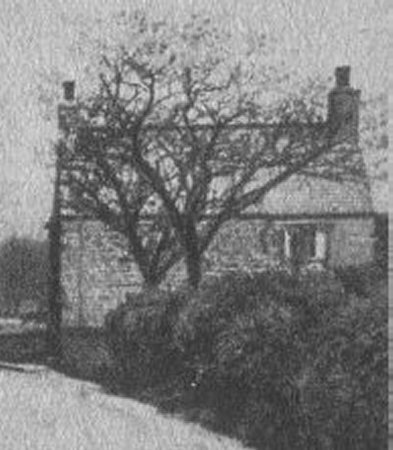 Elizabeth EVANS stayed with her the night before the execution and they said prayers together and on the way to the execution she comforted Hetty. Photo taken:Older postcard was posted in 1904.